As you may be able to tell from my last few posts, I am crazy about the Botanical Builder Framelits Dies and the Botanical Gardens DSP from Stampin’ Up! My card share today features these gorgeous flowers once again, but this time with a different color palette. If you would like to see one of my other creations with this set, click here. Here’s the sketch for today’s challenge. I just love how this card came together. The sketch provided the perfect empty space to fill with a beautiful array of flowers. I also love how the wink of stella provides a little extra sparkle on the Cajun Craze flowers. It is really pretty in person, but I just couldn’t quite capture it on film. To create a thinner mat, I used a pencil to trace the outside edge of the labels collection framelit (4th from the center). Then I cut it out with scissors. I used my Basic Black Stampin’ Write Marker to draw faux stitching along the outside edge of my white die cut panel. I sponged all my flowers with Cajun Craze to give them a little extra interest. I added Gold Wink of Stella to the Cajun Craze Flowers to give them a little sparkle. Don’t forget to finish the inside of your card for an extra special touch. Click the button below to check out what Amy Koenders has created for you today on the next stop of the journey. It is always so much fun to see what other people have created! If you happen to get lost, or want to go back and check out one of the posts, here is a list for you – and don’t forget to leave a little sweet comment on each blog. We love to hear from you! Weekly Deals From Stampin’ Up! March 1st-7th. Click the images below to order the weekly deal products from my online store. The Weekly Deals are only while supplies last and only available at these great prices through March 7th. Here is the color combination for today’s challenge. The color challenge was inspired by the Birthday Bouquet DSP. I just can’t get enough of the floral images in this paper pack. They are simply gorgeous! I added a little Wink of Stella to the flowers to add a bit of shine. I must say, I’m not a huge fan of glitter, but I am in love with that little brush! It gives just a bit of sparkle without being over the top. I brushed clear Wink of Stella on the flowers on the DSP to give them a little shimmer. I also used Wink of Stella on the die cut flowers and on the flower inside the card. I used a sponge to add some Watermelon Wonder and Pool Party ink to the edges of my flower petals. The effect is subtle, but it makes a big difference. Use a bone folder to curl up the edges of your petals to give them more interest. I also adhered the larger flower with a Stampin’ Dimensional to give the card depth. I couldn’t resist using one of the Botanical Garden Jewels Embellishments for the center of my larger flower. Isn’t it just gorgeous! I used the Fine-Tip Glue Pen to adhere the fern frond die cut. It is the perfect choice for really intricate dies. Don’t forget to finish the inside of your card for an extra special touch. For this card, I wanted to try out “borderless coloring.” I colored the flower from the Birthday Blooms stamp set with blushing bride, early espresso, and mossy meadow markers and stamped it on the white card stock. Then I used a blender pen and my ink pads to color in the flower. By stamping my image in the colors I used to color it in, I got a flower without a black outline. I think that this method helps the flower on the inside to better match the flowers on the DSP. I love doing blog hops, it is so fun to see how different artists approach the same color scheme for inspiration. Click the button below to check out what Amy Koenders has created for you today on the next stop of the journey. Weekly Deals From Stampin’ Up! February 23rd-29th. Click the images below to order the weekly deal products from my online store. The Weekly Deals are only while supplies last and only available at these great prices through February 29th. My card share for the Happy Stampers Blog Hop today features the Botanical Blooms stamp set and matching framelits from Stampin’ Up! I cannot tell you how much I love these framelits. It is so easy to create such unique flowers with this set. I especially love the larger flower with the cutouts on the petals! And speaking of flowers, how about that gorgeous Birthday Bouquet DSP! I used this same sketch for another card a few weeks ago. I always think it is so interesting to see just how many different creations you can come up with from one inspiration point. If you missed my previous post, you can view it here. I brushed clear Wink of Stella on the blue flowers on the DSP to give them a little shimmer, although it is hard to see in the photos. I used a sponge to add some Watermelon Wonder ink to the edges of my flower petals. The effect is subtle, but it makes a big difference. I love doing blog hops, it is so fun to see how different artists approach the same sketch for inspiration. Click the button below to check out what Amy Koenders has created for you today on the next stop of the journey. Weekly Deals From Stampin’ Up! February 16th-22nd. Click the images below to order the weekly deal products from my online store. The Weekly Deals are only while supplies last and only available at these great prices through February 22nd. My card share for the Happy Stampers Blog Hop today shows two different variations of the card I shared with you last week featuring the Wild about Flowers stamp set from Stampin’ Up! If you missed that post, you can see it here. 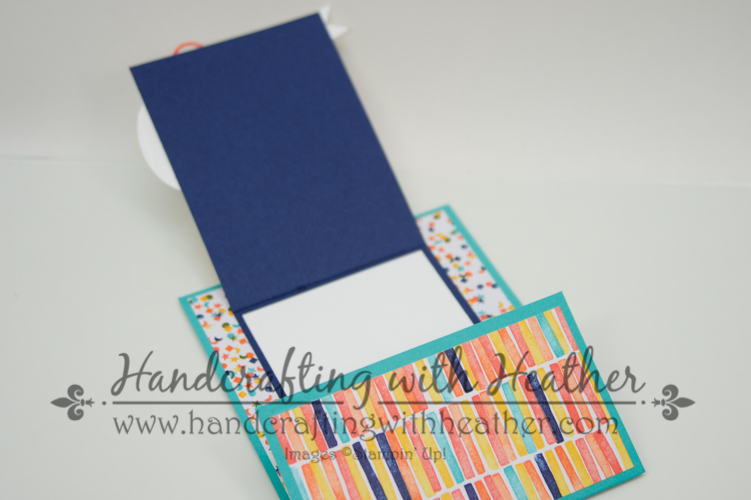 I thought it would be fun to show you how you can change the look of a card by simply using a different piece of designer series paper. This week’s color challenge is Blackberry Bliss, Hello Honey, and Old Olive. I used the Farmers Market DSP for each of my cards, but by changing the stamping a little, and switching up the colors of the layered panel, you get several pretty looks. Stamp the images on Very Vanilla card stock. Vary the height of the flowers to add visual interest. Stamp just a few flowers, or layer them to look like a field of wild flowers. Layer the panels for the art piece and then tie with ribbon. I run adhesive across the back of the panel to help hold the ribbon in place. Putting a mini-glue dot behind where you want the knot to be helps to tie neatly. I used Stampin’ Dimensionals to raise up the art piece and give the card more depth. 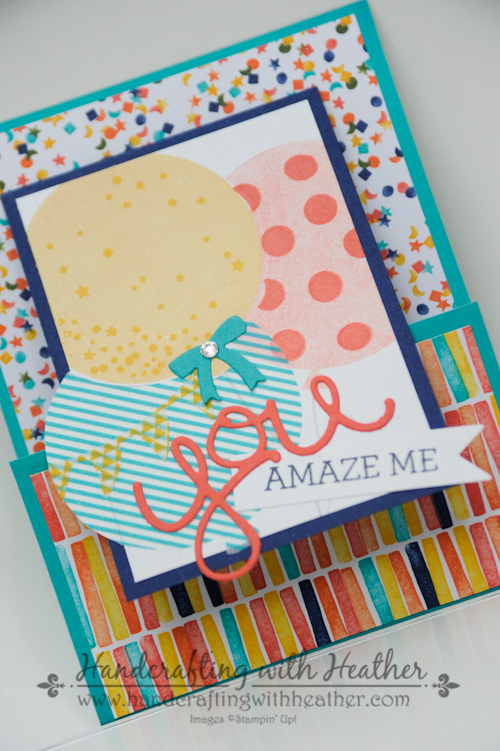 Now that you’ve seen what I created for today’s color challenge, head on over to see the rest of the Happy Stampers’ interpretations. Click the button below to check out what Amy Koenders has created for you today on the next stop of the journey. Click the images below to order the weekly deal products from my online store. The Weekly Deals are only while supplies last and only available at these great prices through February 15th. Wild About Flowers for the Happy Stampers Blog Hop – Stampin’ Up! My card share for the Happy Stampers Blog Hop today features the Wild about Flowers stamp set from Stampin’ Up! Anyone who reads my blog knows that I adore working with flower images, and I’m WILD about this stamp set. The photopolymer stamps make it so easy to stamp these gorgeous wild flowers in a wide variety of colors. Simply beautiful! I love how the country charm of the Farmers Market DSP from Stampin’ Up! compliments the wildflower design. A perfect card for any occasion. Weekly Deals From Stampin’ Up! February 2nd-8th. Click the images below to order the weekly deal products from my online store. The Weekly Deals are only while supplies last and only available at these great prices through February 8th. 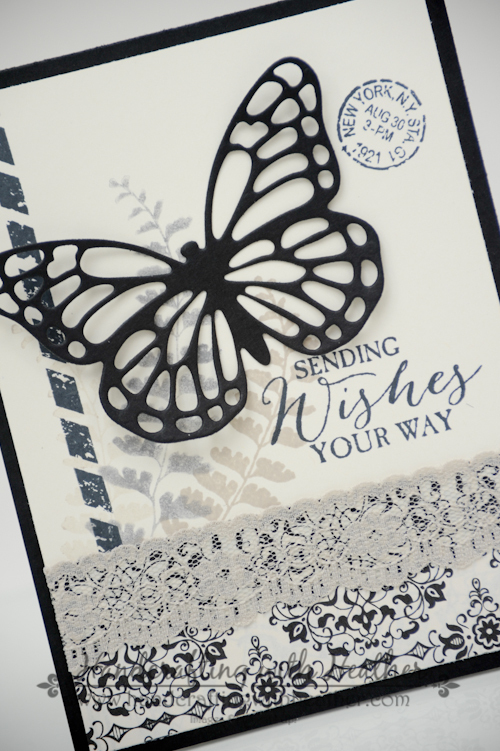 Sprinkles of Life for the Happy Stampers Blog Hop – Stampin’ Up! The Happy Stampers are back with a new color challenge! My card share today features the Sprinkles of Life stamp set from Stampin’ Up! I’m always in need of cute cards for all the birthday parties my son gets invited to, and this project fits the bill. I love how the stamp set coordinates with the Tree Builder Punch too! Did you know that by ordering the Sprinkles of Life stamp set from Stampin’ Up! you can create fun projects and make a difference at the same time? When you buy the Sprinkles of Life stamp set, Stampin’ Up! donates $3 to Ronald McDonald House Charities. The set can be found on the inside back cover of the 2015-2016 Annual Catalog. Can you believe one stamp set can be used to create clouds, trees, cupcakes, ice cream cones, or even a basket of flowers… that’s one versatile tool! Stamp the images on Whisper White card stock in waterproof ink. Choices are Archival or StazOn Black (I used Basic Gray Archival for a softer image). I used the lids of my ink pads and my aqua painter to add the color to the cupcake and candles. I used Stampin’ Write Markers to color the sentiment. Don’t forget to “huff” on the stamp to remoisten the ink before stamping. Press down firmly for a clean image and good ink coverage. I used Stampin’ Dimensionals to give the cupcake a little extra dimension and interest. I fussy cut the candles with scissors. Doing this blog hop has been a lot of fun. Click the button below to check out what Sandi MacIver has created for you today on the next stop of the journey. Click the images below to order the weekly deal products from my online store. The Weekly Deals are only while supplies last and only available at these great prices through February 1st. Stampin’ Up Fry Box & Elfin’ Fun! Hi everyone! I know I haven’t posted anything in an age and a half, but I was inspired to share some of my family’s fun with our elf, Edwin. I arrived home from work today to find a care package at my front doorstep from my dear friend, Amy Koenders (you can check out her awesome blog here.) What a wonderful surprise to find the Stampin’ Up! Fry Box Die and All About Sugar Stamp set along with some chocolates and a beautiful card! I knew right away that I wanted to use it for my Elfin’ Fun! Isn’t that fry box just the cutest! It was SO EASY to make too! One run through the big shot, and two strips of adhesive, and voila! 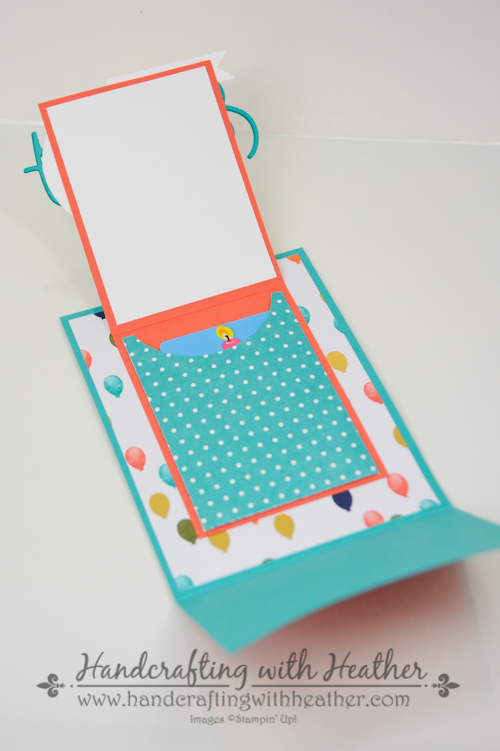 I just love the polka dot design of the Merry Moments DSP from Stampin’ Up! I also love the Elf on the Shelf tradition. I have so much fun scouring the boards of Pinterest for inspiration. There are a million cute ideas out there, and there is nothing better than seeing my son Carter’s face light up as he reacts to Edwin’s antics. It is the first thing he does each morning. He just can’t wait to see what Edwin has been up to during the night. Here are some more of Edwin’s adventures from 2015. I hope you have enjoyed my share today. 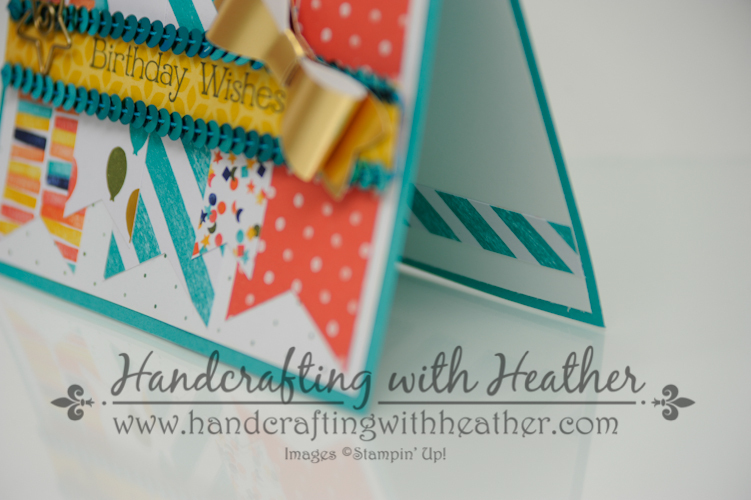 Happy Holidays to all… I hope to be back in the New Year with some more stamping projects. If you need any supplies you can shop now in my online store! Feel free to drop me an email if you have any questions. I’m here to help! Click the images below to order the weekly deal products from my online store. The Weekly Deals are only while supplies last and only available at these great prices through December 14th. 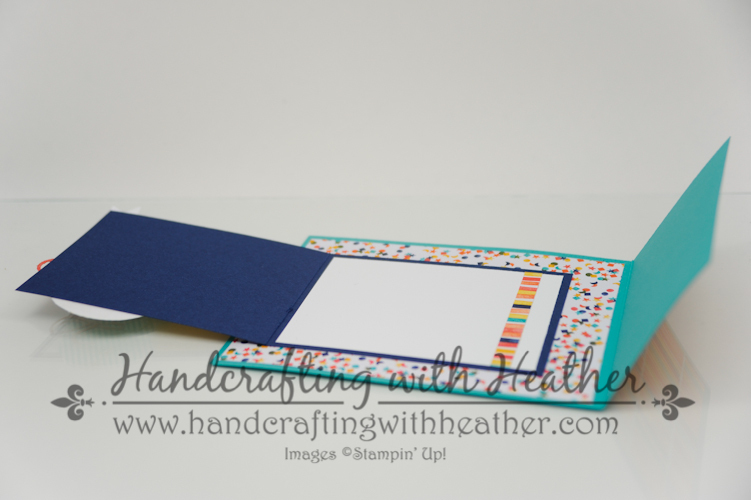 Happy Stampers Spring Blog Hop – Stampin’ Up! The Happy Stampers are back today with a Blog Hop that is all about Spring! I have created a project for you today. 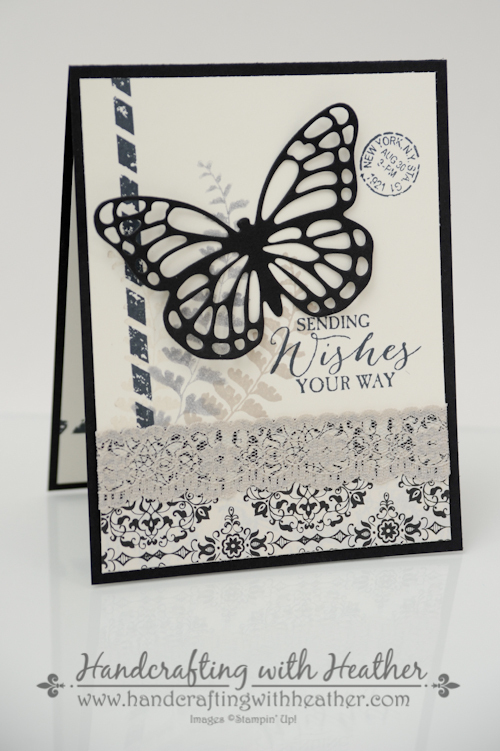 that features one of my favorite products, the Butterfly Basics stamp set and coordinating Butterfly Thinlits. This set is just so versatile! I love how this one turned out with the Typeset DSP and the lace trim. The black and vanilla color scheme is just so elegant. I finished off the inside of the card by stamping the fern image and the border stamp with Memento Black Ink. 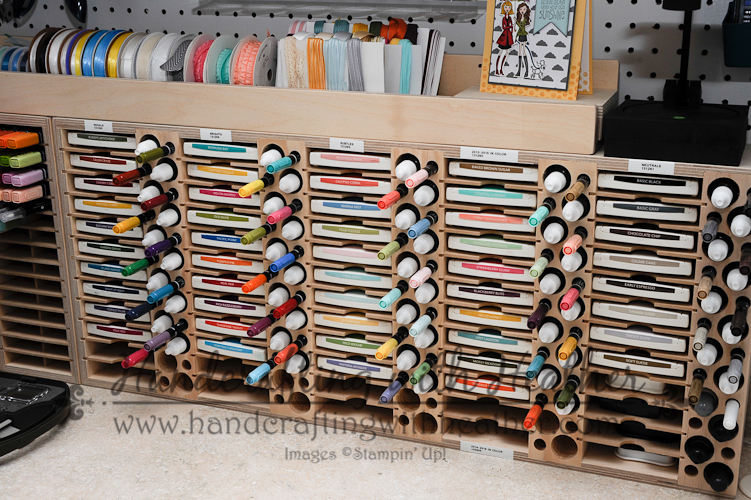 In addition to our spring card projects, the Happy Stampers are also sharing some of our favorite ideas for organizing your crafting space. As many of you know, I remodeled my guest bedroom into a crafting space almost a year ago. 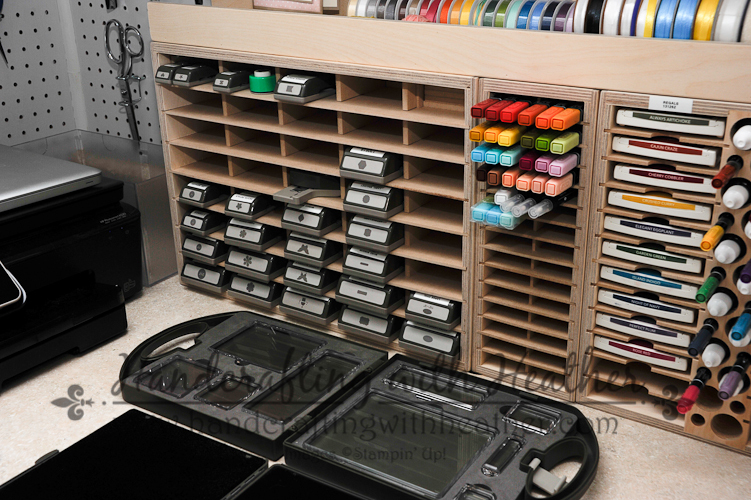 I LOVE, LOVE, LOVE my craft room, and there are tons of great organizational features in there. However, my favorite items are the ones I bought from Stamp-N-Storage. Stamp-n-Storage Combo Ink Pad Holder houses all of my ink pads, ink refills, and Stampin’ Write Markers. I love how these products are created to fit Stampin’ Up! products exactly. They come in a variety of sizes and they organize everything right there on my crafting counter within arms reach! 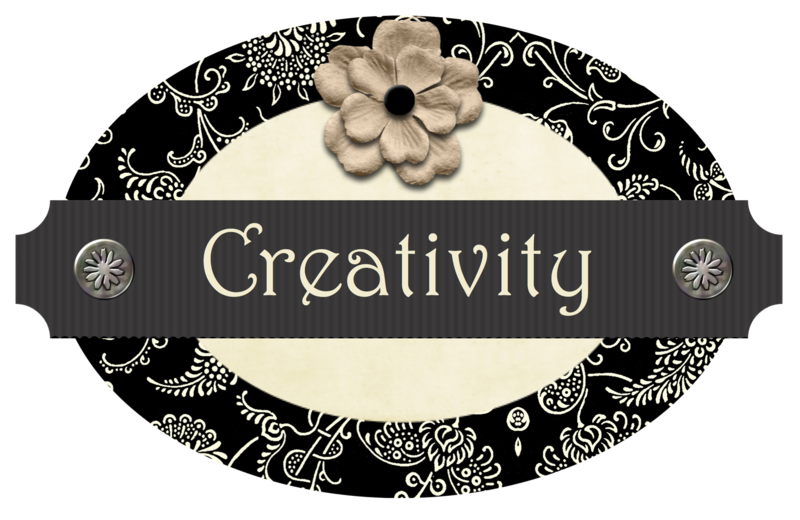 If you would like to see a tour of my crafting space, you can read my previous blog post here. Of course, a blog hop wouldn’t be complete without some blog candy! One lucky reader who leaves me a comment will receive the Layers of Gratitude Paper Pumpkin kit. 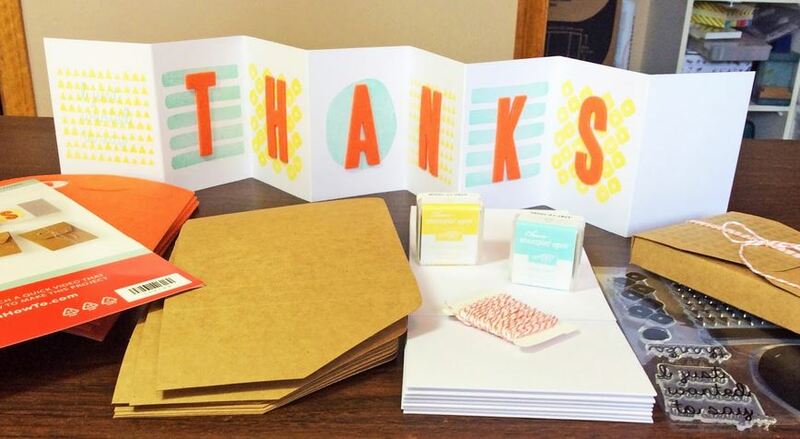 The kit comes with everything you need to make a set of adorable folding “thank you” cards. To enter to win, leave me a comment telling me about your favorite Stampin’ Up! item for Spring. I will announce the winner in my Tuesday Updates post on March 31st! Good luck, I can’t wait to hear your comments. Doing this blog hop has been a lot of fun. Use the arrow buttons below to check out what Amy Koenders has created for you today on the next stop of the journey. Click the images below to order the weekly deal products from my online store. The Weekly Deals are only while supplies last and only available at these great prices through March 30th. 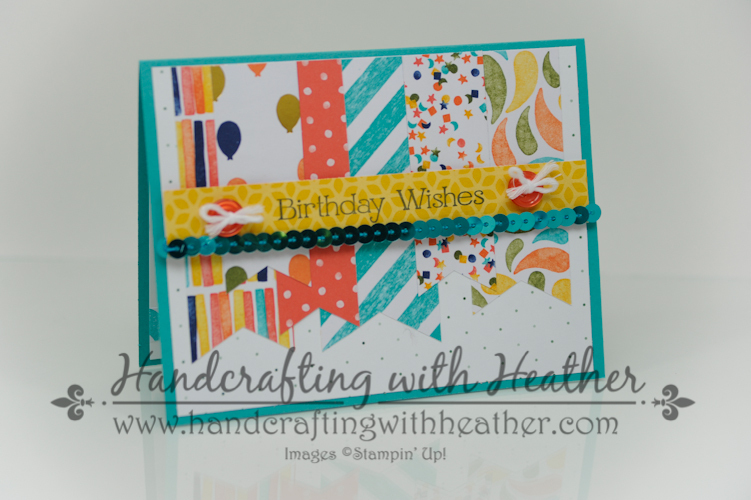 Happy Stampers Birthday Card Blog Hop – Stampin’ Up! 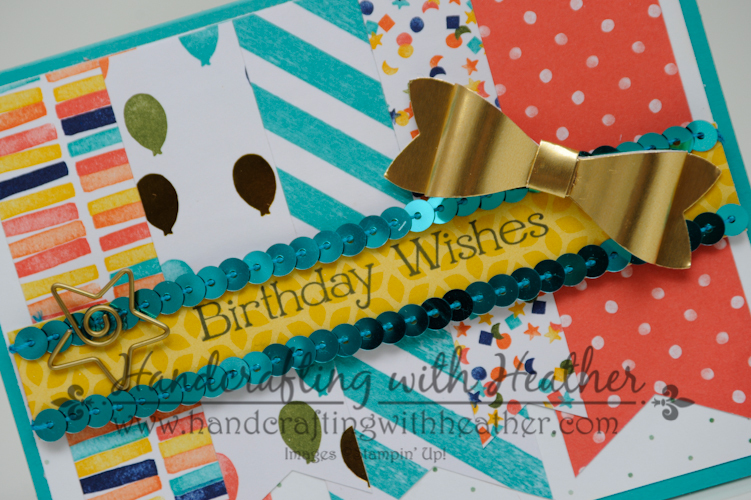 The Happy Stampers are back today with a Blog Hop that is all about Birthdays! I have created three projects for you today featuring the Celebrate Today stamp set from Stampin’ Up! and the Hello You Thinlits Dies. My projects today are made using the “Joy Fold” technique. I have been having a great time with this fold lately. It is a wonderful way to use your Designer Series Paper for a great impact with not too much effort. The cards today feature the Birthday Bash Specialty DSP, which I am totally in love with! This picture shows you how the Joy Fold card opens up. when it is closed, the card just looks like a series of layered panels, but when you open it up, you see that the fold is a bit special. Another product that I love is the Hello You Thinlits Dies. 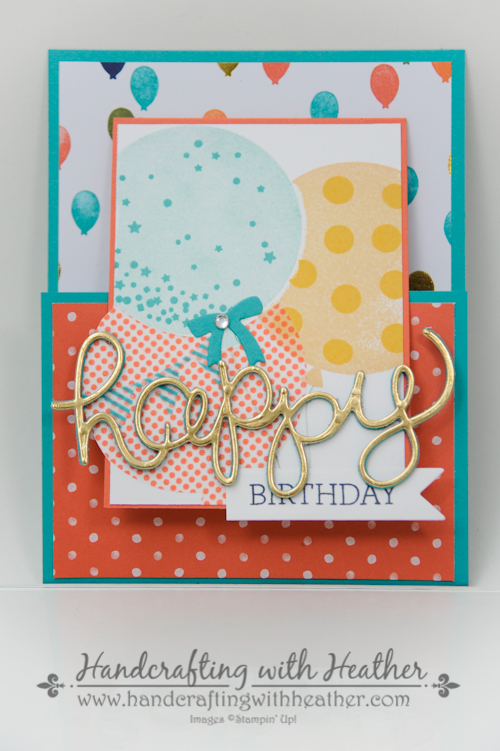 For my first card I wanted to pull in a little gold to match the gold balloons in the DSP. I cut the “happy” die from the Hello You Thinlits five times (4 Bermuda Bay & 1 Gold Foil) and layered them for a three dimensional element. On the inside of the card, I created a little pocket for a gift card! Isn’t that just too cute! And, there’s still plenty of room for a little birthday message on the top flap of the card. My next two projects are variations on the same theme. I used the Celebrate Today stamp set and Balloon Framelits Dies to create the front of each card. Two of the balloons are stamped directly on the card stock using the masking technique, and the third is die cut from the Birthday Bash Designer Washi Sheets. I played around with variations of the Hello You Thinlits and the Crazy About You stamp set for the sentiments on each card. I used different variations of the Birthday Bash Specialty DSP for each card to give them slightly different looks. For this card, I left the inside blank instead of including the gift card pocket. Of course, a blog hop wouldn’t be complete without some blog candy! One lucky reader who leaves me a comment will receive the Cute as a Button Simply Sent Kit. The kit comes with everything you need to make 8 cards! The buttons and ribbon are just adorable. 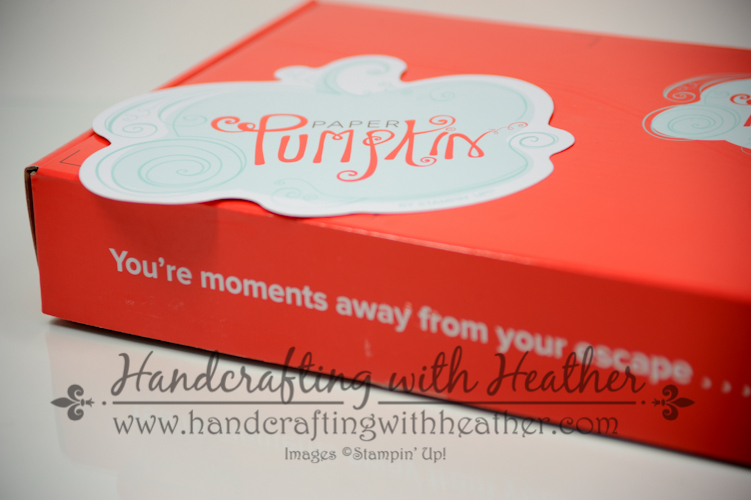 To enter to win, leave me a comment telling me about your favorite Stampin’ Up! 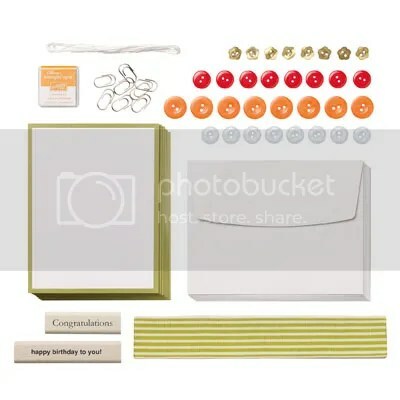 item for creating birthday cards. I will announce the winner in my Tuesday Updates post on March 3rd! Good luck, I can’t wait to hear your comments. Click the images below to order the weekly deal products from my online store. The Weekly Deals are only while supplies last and only available at these great prices through March 2nd. 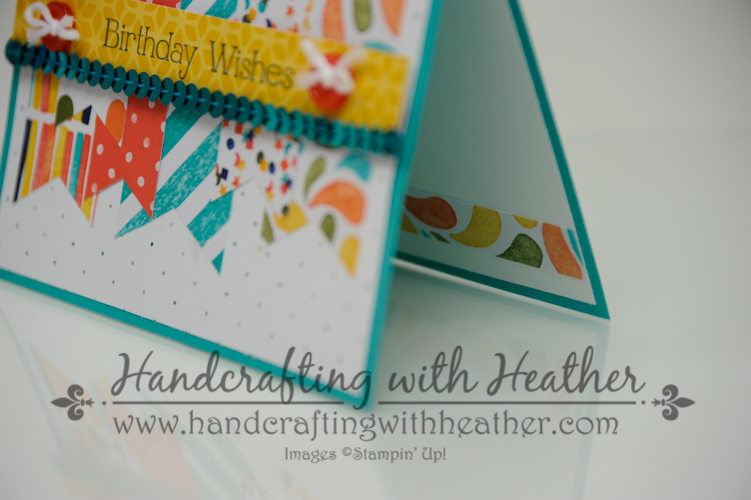 A Real Birthday Bash… Stampin’ Up! Style! Now that Valentine’s Day is behind us, it is time to celebrate some birthdays! 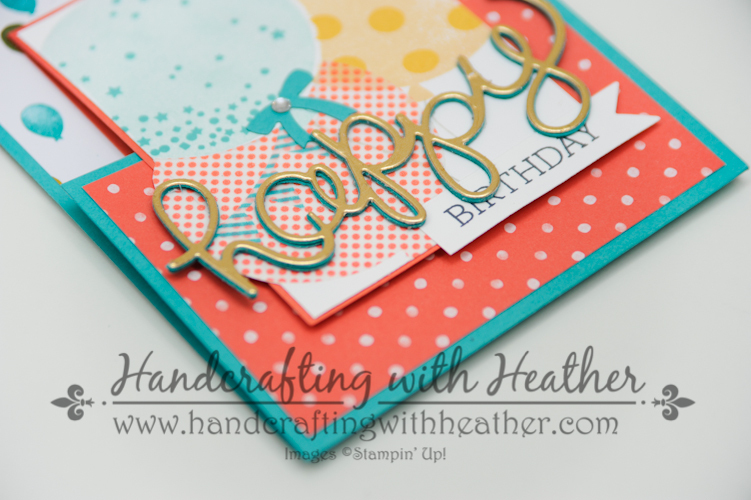 I am totally in love with the Birthday Bash DSP from Stampin’ Up! So much so, that I had to find a way to use every last scrap of it! Isn’t that festive! The Happy Stampers group has a “Birthday Bomb” club, where we “bomb” people with birthday cards on their special day. It is so much fun to receive the cards in the mail when it is your turn. Well, there are LOTS of birthdays in this club during February and March, so I need to get busy! I love how the different patterns of this DSP came together. That is one of the great things about Stampin’ Up! All the colors coordinate, and it is so easy to create designs that work. Here’s another variation on the same card idea. This time I decided to use the brand new Bow Punch! Isn’t it just adorable? And, did I mention that the bows are really easy to make and come together quickly… but you should be prepared to use a bunch of glue dots. LOL! For the inside of the cards, I simply added strip of the DSP to the bottom. It is amazing how something so simple can really make a difference! Well, I succeeded in not wasting any of my Birthday Bash DSP, and I got a jump on some of those birthday cards I’ll need in the coming weeks. If you are a fan of this project, I hope you will pin it to Pinterest for me. You will find a “pin it” button at the very bottom of this post following the supply list. Click the images below to order the weekly deal products from my online store. The Weekly Deals are only while supplies last and only available at these great prices through February 16th.